Engaging respondents with interesting measurement tasks. Involving clients with visualizations of actionable findings. Challenging marketing research to provide a theoretical basis for its measurement procedures. I have generated some data consistent with the rank ordering of these five brand tests in order to show you the R code and the output from an item response model. I have provided all the R code needed to generate some data and run the analysis at the end of the post in an appendix. In addition, here is a link to a Journal of Statistical Software article by Dimitris Rizopoulos. He works through all the same code when analyzing five items from the LSAT (Section 3.1). I deliberately created a “matching” example so that you could see two worked examples from different perspectives. Rizopoulos more fully discusses the code and the output, while I try to "develop your intuition." Note that the two profiles with the largest percentages of respondents are all No's (the first row with 18.0% or 36 of the 200 respondents) and all Yes's (the last row with15.0% or 30 respondents). This means that 18% received the lowest possible score and cannot be differentiated further without adding another brand strength test (something easier than favorable image, like awareness). Similarly, at the other end of the scale we find 15% with the highest possible score. If we wanted to separate this 15%, we would need to add a more severe test than recommendation (e.g., continue to purchase after major price increase). We will run one of the more common IRT models, the two-parameter logistic model. 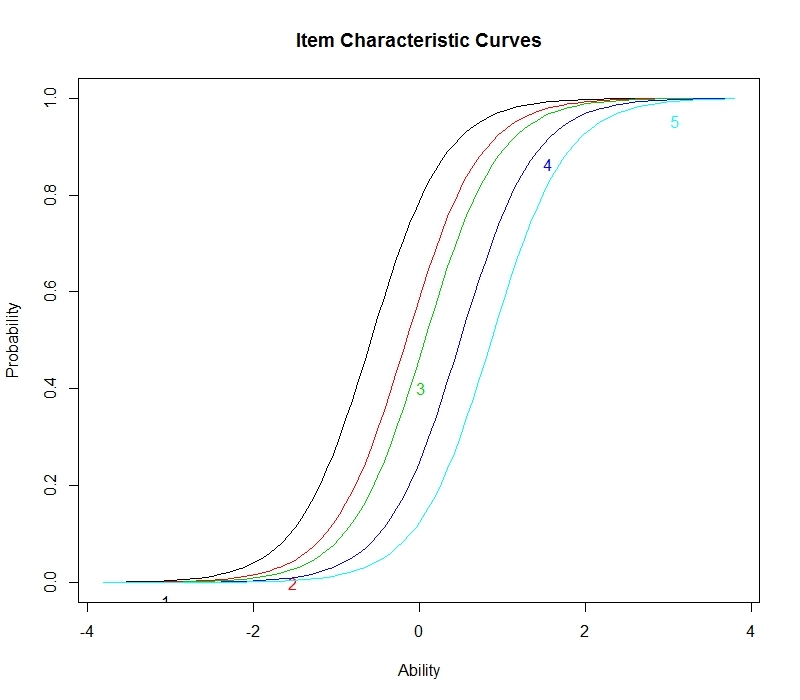 To understand what the two parameters are, we look at the item characteristic curves. These are logistic functions, one for each of the 5 brand tests. Each one shows the likelihood of checking "Yes" as a function of the respondent's score on the underlying latent variable, called ability for historical reasons (the first applications were in educational testing). The location estimates nicely separate the five brand tests. They indicate the score on the latent variable that would yield a 50-50 chance of saying "Yes" to each item. As we noted when we looked at the response pattern matrix, these five brand tests do not do a good job of differentiating respondents at the very top or bottom of the scale. You should remember that 18% gave the lowest possible responses and 15% gave the highest possible responses. We see this in the location parameter that range from only -0.57 to 0.83. We would need to add easier items (location below -.057) and harder items (location above 0.83) in order to differentiate among these two large groups. I should note that I am interpreting these location parameters as if they were z-scores with a mean of 0 and a standard deviation of 1. Although one always needs to check the distribution of latent scores in their particular study, this is not a bad “rule of thumb” when you have many items and a normally distributed latent variable. The slope parameters indicate how quickly the probability of saying "Yes" changes as a function of changes in the latent trait. Item 4 measuring Satisfaction has the steepest slope. In fact, its steepness causes the item curves to overlap, meaning that there is a range of the latent trait where the likelihood of saying Satisfied (4) is greater than the likelihood of saying Purchase (3). This is not a happy result. We would like for the five logistic curves to be parallel (same slope) or at least for them not to overlap. That is, we would like for Satisfaction to be a more severe test of brand strength than Purchase for everyone regardless of their level of brand strength. The slope indicates how well the item is able to discriminant among the respondents. A flat slope tells us that the probability of saying "Yes" changes slowly with increases or decreases in the latent variable. A steep slope shows that the likelihood of "Yes" changes quickly over a small interval of the latent trait. The contribution that each item makes to the latent score depends on its slope (see section on scoring in this Wikipedia entry). Individual Difference Dimensions. The dimensions that IRT uncovers are between-person. Different respondents see the same brand differently. We can aggregate respondents and calculate the "brand strength" of many different brands. But now the analysis ignores individual differences among the respondents and focuses on the brands. It is important to maintain the distinction between brand-level and individual-level analyses. It is a big post, but item response theory is nicely explained thanks for the interesting post.Market and Research. Let's Do Some Hierarchical Bayes Choice Modeling in R! Warning: Sawtooth's MaxDiff Is Nothing More Than a Technique for Rank Ordering Features! The Relative Importance of Predictors - Let the Games Begin!